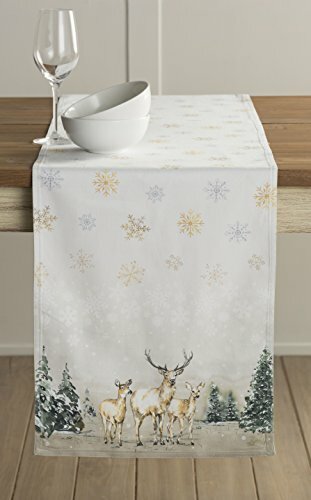 Maison d' Hermine Deer In The Woods 100% Cotton Table Runner 14.5 Inch by 72 Inch. About the Product: Bring the peace and serenity of a snow-covered forest into your home with the brand new Deer in the Woods table runner from Maison d' Hermine. Illustrating the whimsical beauty of a winter wonderland, the design presents an enchanting portrayal of flakes of thick snow drifting down on a pine forest populated by herds of reindeers. Snow crystals take center stage with the deers and the pine trees featuring on the sides while the back completely shows flakes of different sizes and colors clustered together. Made from 100% cotton, our Deer in the Woods table runner makes a festive addition to the holiday home. About the Collection : Apart from cold air and a thick blanket of snow, few things in nature signify winter holidays as well as pine trees and reindeers. Our Deer in the Woods collection is just about that - celebrating the spirit of the season. Inspired by a scene from an icy white winter wonderland, the main motif depicts a herd of reindeers migrating through a sparsely grown pine forest laden with slushy-white snow. The details- the metallic white tones of the snow, the bluish green tones of the pine trees, and the gilded brown tones of the deers are quite realistic, making each product very graceful. About the Brand: Maison d' Hermine is a one-stop destination for people wanting a well-curated collection of charming and sophisticated table & kitchen linen. Designed to add an authentic European touch to your home, each collection is a work in art itself with intriguing details, artistic patterns, wonderful textures and rich colors. From modern themes to timeless classics each design is meticulously hand painted in water color and then expertly crafted down to the last detail on fabric with print. We pride ourselves on the stylish and practical choices we offer which are devoted to bring you products that inject color and character to your home. Coordinated Tablecloths and Napkins are available in this collection. If you have any questions about this product by Maison d' Hermine, contact us by completing and submitting the form below. If you are looking for a specif part number, please include it with your message.